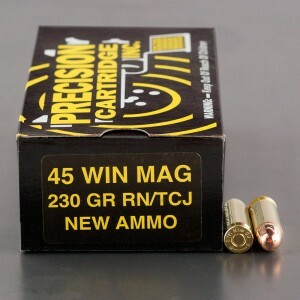 45 Win Mag ammo, or 45 Winchester Magnum, also known as the 45 Magnum, is an extremely potent rimless cartridge designed to be used in semi-automatic pistols. The round was developed by stretching the case of a 45 ACP round and increasing the thickness and strength of the shell. The 45 Win Mag is ballistically similar to a cartridge once designed for the Canadian Military known as the 45 NAACO. The round is most commonly used as a hunting cartridge. This makes it one the few rounds designed for a semi-automatic pistol that has been widely adopted for hunting. Typically the preferred handgun hunting weapons are large revolvers in magnum, rimmed, cartridges. The 45 Winchester Magnum is also a popular silhouette shooting cartridge due to it’s amazing knockdown ability. The 45 WIn Mag generates roughly the same power as a 44 Magnum. The 45 Winchester Magnum is capable of firing a round heavier than the 44 Magnum with a higher velocity. With a 300 grain round capable of reaching over 1,100 feet per second. The 45 Winchester Magnum had a variety of different 1911 style pistols chambered for it, and a line of Thompson Center Arms single shot hunting pistols. The 45 Winchester Magnum cartridge is an immensely powerful round that it a very capable hunting cartridge.